Namrata S. Chandhok received her MD from the George Washington University School of Medicine in Washington, D.C. She completed her residency in Internal Medicine at Tufts Medical Center in Boston, MA and is currently a third-year hematology/ oncology fellow at Yale University School of Medicine/ Yale New Haven Hospital. 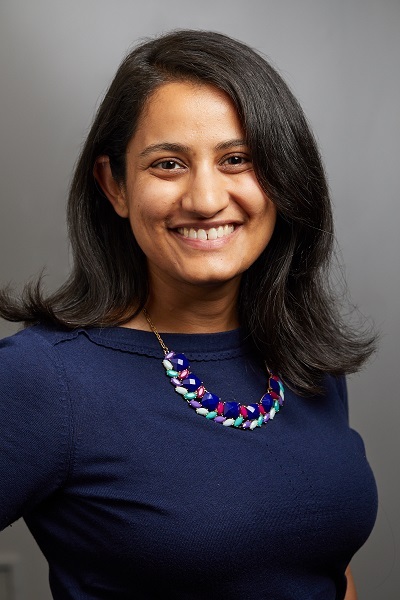 As a fellow at Yale Namrata is engaged in translational research in myeloid malignancies focused on the identification and exploitation of novel tumor-associated vulnerabilities for therapeutic gain, co-mentored by Dr. Thomas Prebet (hematology), Dr. Ranjit Bindra (radiation oncology), Dr. Stephanie Halene (hematology). Based on their recent discovery that isocitrate dehydrogenase (IDH) mutant tumors have inherently defective homologous recombination repair Namrata developed a phase II clinical trial with Dr. Prebet of olaparib in patients with IDH1/2 mutant relapsed/refractory acute myeloid leukemia and myelodysplastic syndrome that received Cancer Therapy Evaluation Program (CTEP) approval. In the laboratory Namrata is working to identify novel drug combinations to maximally exploit defective DNA damage repair, and improve our understanding of the genomic, proteomic and immunologic changes secondary to oncometabolites in IDH mutant hematologic malignancies.